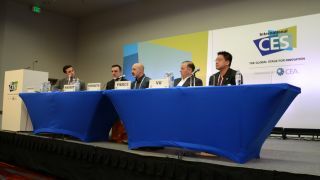 During CES 2014, Timothy Stenovec of the Huffington Post led a discussion on wearables stating the tech is the biggest thing at the show, but conversely still haven't found mainstream stride. Stenovec quoted a recent piece of Forrester research that said only about 5% of US adults are willing to wear an activity sensor. Sonny Vu, Misfit Wearables Founder chimed in first: "Wearables encroaches on new territory in many ways that are unfamiliar with the tech world such as fashion and comfort." Vu of course was speaking to the wearables niche having its own particular challenge in designing devices that must look good while being well fitting. As such, the real challenge is to not only create a device that users will wear but also remember to carry and use everyday. Chris Massot, chief marketing officer at Synapse, accounted for the wearable device challenges with real world experience roughly six years ago: "We were working with smartwatch companies five to seven years ago and they were astounded at how much fashion played into their ability to be successful with wearable devices." Massot continued on to say the next challenge is to develop usage cases for everyone, everyday. Stenovec added his own use of wearable devices all follows the same pattern, which could be shared by many other users: "I wear it for a couple of weeks or maybe I had to take it off to charge it and I forget about it." The solution then is to make a device more sticky with more than one use case. Massot jumped back in to say, "You're not going to wear a set of things on your wrist. You've got activity trackers, stuff that does door access, mobile payment and different things that can be done somewhere else than your wrist." "Until devices start capturing a lot of those things together, that's going to create a scenario where I'm not going to want to forget it," he added. Massot likened the potential of smart wearable devices to how smartphones have become an integral part of our ever day lives. "Just like you won't leave the house without your smartphone because I can't make calls and I can't do emails, it's like I'm leaving the house naked," Massot expounded. "Look at your wallet, all the things that can be replaced by a wearable device; you've got your credit cards, your door access, ID, Passport, and all these things that could be replaced ultimately by a wearable device and then you've got something." MP3 players and GPS units have conflated into smartphones, there is a general feeling that the same thing will happen with activity trackers being rolled into smartwatches. While consolidation might make wearable devices more attractive for users, it also overlaps with many of the things we already use smartphones for. The only original notion behind wearable devices is then, medical information tracking. Activity trackers first started off as glorified pedometers with an LCD watch. But now the wearable space is making a greater push to understand different types of activities and contextualizing that data into something useful for users. "The need for the ability to track health information on how I'm doing and then modifying care and treatment of my individual situation in an efficient manner is dire," Stephen Pierce, IBM Medical Devices Leader, explained. "Now we're spending 17% of US GDP on healthcare in a highly inefficient system focused on episodic care that will take care of me after I'm sick," he continued. "So [we should] focus on preventative care, being able to understand genomic, personal, and vital data. Those types of data sources could drive quality of [health] care and financial efficiency." In a grander sense, activity trackers have allowed more users to know more about their bodies at all times and as such has increased medical literacy for this generation of wearable users. Beats per minute and glucose levels aren't only revealed to users, but fed into recommendations and warnings on activity trackers like the Fitbit Force and Nike FuelBand SE. Beyond smartwatches and activity trackers, Chief Technology Officer and Founder of Heapsylon, Mario Esposito began development of smart socks and other wearable devices wrapped into clothing items. Heapsylon created a pair of bio-tracking Sensoria smart socks that do more than the typical activity tracker by actually sensing how users are placing their foot on the ground. It in turn gives them suggestions on how to improve morning runs or golf swings. Moving into even more wearables, Pierce estimates that everyone will be carrying 10 types of wearable devices associated with their bodies in the next five years just between implantables and ingestables all capturing data. But before these things happen, power still remains a gigantic problem in the wearable space. "Battery capacity and energy density has moved in a very non-Moore's law like manner," Vu accounted. "One of those great breakthroughs we're all waiting for is energy density - whether that's through better batteries, better charging systems, or just power harvesting." The wearable segment ballooned here at CES 2014 between new entries like the Razer Nabu Smartband and Sony Core, but clearly they have a long way to go. Razer's Project Christine is monstrous, and here's our first look at it.